If I have to give a single phrase verdict for the book then it would be Well-researched. Ashwin Sanghi has written a well-researched book, engraved deep into the History of the Indian Sub-continent and linked it well with the history of South Asia. I love history, especially Ancient Indian History from the times of Indus Valley Civilization through Vedic Period and Buddhism to the reigns of Harshawardhana. The complete material history of the period has some continuity. It has been a well-proven fact that Indus Valley Civilization was not robbed off its glamour by a migrating tribe of Aryans from Western Asia. However, no one has been able to say that the same group of people represented Indus Valley Civilization and Vedic Society. Nevertheless, Ashwin Sanghi has presented this theory, though as a part of fiction, in a very efficient and effective manner. While reading the book, I somehow forgot that I am reading a work of fiction and read the book as a commentary on Indian History. I would consider this as a commentary on Indian History only if it was not produced in the way it was, it actually was defining the new History for India. Ancient History has always been confusing what with several distortions by both Foreign (especially English) and Nationalist authors who in an attempt to prove their points about Golden Era of India tried to divulge things, which were not there. Ashwin Sanghi’s book comes as great breather as it shares the same sentiments as my understanding and interpretation of the history goes. The story revolves around Dr. Saini, who is a professor of History, who also happens to be the descendents of Yadava clan of the times of Krishna. The aim of the Dr. Saini is to prove that he is not the murderer of his friend Dr. Varshaney, an Archaeologist based in Kalibangan. 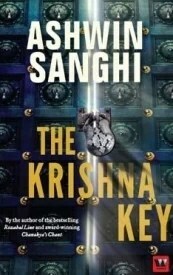 To prove himself right, Dr Saini begins the quest for The Krishna Key. How he interprets different signs and symbols, proves his innocence, and finally deciphers the Krishna Key is the main theme of the story. I will not divulge much of this here. If you want to find out then just grab your copy and start reading. If you love history and are open to different point of view of interpretation then go for this book. It is a must read. There were few instances of poor proofreading towards the end of the book, but they can be easily ignored. Actually, the book will attract your attention so much, that you will not have time to think about these mistakes. So, do not worry about them. Note: I received an author-signed copy of this book as a gift from My Smart Price in return of a review of this book on my blog.